Consumed by Books: To Reread or Not to Reread? To Reread or Not to Reread? I love reading and talking about books with others. It’s why I have a blog and why I chose librarianship as a career. I spend a lot of time reading because I should do it so I can conduct readers’ advisory, and because it helps me relax. One of my shelves. Mostly unread books. We all know how reading is. Most bibliophiles have a long list of books to read and often feel behind. There are some books you love, some that you think are only okay, and some that you actually feel really relieved to finish. I am the type of person who loves the idea of reading my favorite books repeatedly. Since middle school, though, I feel as though I haven’t done that very often. Honestly? I feel guilty when a pick up a book to reread it. At the time of writing this post, I’ve read 105 books thus far this year. I’m hoping that if I try hard enough I can possibly get to 125 by the time 2012 is over. Obviously, I’m happy with this number, especially since I also got a master’s degree this year (admittedly, a good handful of the books I read were for school). Sometimes, though, I can’t help but think of all of the books I still haven’t read. On the one hand, this is a blessing: I will never run out of books to read, and will probably love several of the titles I have yet to discover. On the other hand, sometimes I wonder when I am ever going to feel caught up. It doesn’t help that some books are titles I have accepted for review. Don’t get me wrong, I love receiving ARCs and finished copies for review, but in addition to mixing in my own books, I try to read them in a timely manner. I should point out that according to GoodReads, I have roughly 250 unread books that I own, but I'm fairly certain that number is not up-to-date. Plus, I periodically get library books, which are obviously time sensitive. You see now why I have issues fitting rereads into my schedule. There’s a reason behind rereading books. Typically, I want to reread book because I’ve fallen in love with it: the setting, the writing, and the characters. I just finished a reread of Harry Potter andthe Prisoner of Azkaban because I wanted to reread all of the books before the movies came out. I’m going to give you guys a few minutes to laugh over how epically I failed there. Anyways, I would only pick it up sporadically, because I’d get caught up in reading other books. Every time I did venture back into the pages it was like visiting an old friend. I’d think of how much I loved a particular character, why I liked a certain part of the book, and get caught up all over again. As I was reading, something occurred to me: like a close friend or favorite uncle, Harry Potter and the Prisoner of Azkaban is always going to be there. I purchase books that I know I plan to reread so I never have to worry about not having a copy. Knowing that a book will be around your entire life should makes me feel as though I have ample time to reread it, and it’s okay if it gets shuffled around. 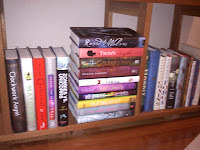 However, I don’t want to shuffle books around in my TBR pile just because I’ve already read them. I love to revisit the stories that made me fall in love with reading, made me want to pick up more books that would give me a similar feeling, or just completely absorbed me for a few hours. We all know the cliché “Make new friends, and keep the old. One is silver, the other gold.” Sure, it’s overused, but I feel the same way about books. Even though I keep finding new ones to love, I want to revisit those that I've enjoyed for along time. Although I often reread books because I love them, that isn’t always the case. At some point in middle school I read Monster by Walter Dean Myers and strongly disliked it. I reread in graduate school for a class, and I barely remembered anything about it. Guess what? I loved it the second time around. I also reread Hatchet by Gary Paulsen, another book I read when I was young and didn’t like. I thought it was better this time, but still wasn’t in love with it. Of course, then there’s the case where I reread a book because the next one in the series has just been released. I’m currently hoping to reread two books because they recently had sequels come out, namely Nevermore by Kelly Creagh and The Unbecoming of Mara Dyer by Michelle Hodkin. I loved Nevermore, and feel the need to reread it because it was rather complex. I actually was sort of on the fence about The Unbecoming of Mara Dyer the first time around, so I’m curious to see how my feelings change with a reread. Somehow, I don’t feel as guilty about taking time to reread these two. I mean, by reading each of them, I’ll be knocking books off my TBR pile when I move on to the sequels. I don’t want reading to be a numbers game, where I feel like I have to justify reading the things I want. Yes, I do need to write reviews of a lot of review books, and am behind on the pile. However, I also want to keep comfort reads that I love in the mix. From now on, one of my goals is to try harder to make time if I want to read something again. Will I still read tons of new books? Of course. But when I pick up my copy of The Hobbit because I just have to read it again before seeing the movie, I’m not going to feel bad because some other book isn’t being read. I’m going to enjoy myself. Do you feel conflicted over rereading, or am I just crazy? Who else feels perpetually overwhelmed by their TBR piles? Please let me know in the comments, because I’d love to hear about it. Sometimes I go through phases where, if I'm not reading only review book after review book, I feel extremely guilty. Then I'll suddenly switch off and think "Reading is supposed to be fun. I'm only going to read books I own for awhile, screw obligation reads!" The only good thing about the fact that I am obviously CRAZY is that - in the end? I think it evens out. I am a huge re-reader and there are some books that I own that I have revisited into the double digits (Harry Potter, Princess Diaries, and anything Madeleine L'Engle, C.S. Lewis, and Diana Wynne Jones). 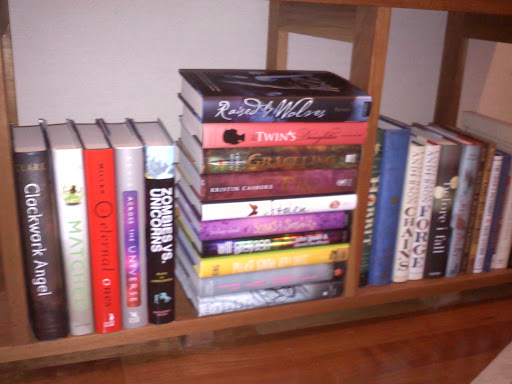 Like Allison, I go through spurts when it comes to re-reading and reading books I've bought. I usually read whatever happens to suit my fancy that day unless its for a tour book which I try to read as soon as possible. I feel no guilt when it comes to going back to a favorite because sometimes it's just nice to return to something you know you're going to love and because I always notice something new about them.